Most notably, in 1867, Seward obtained the Alaskan Territory from Russia for a purchase price of $7.2 million. Fearing future loss of the territory through military conflict, as well as desiring to create challenges for Great Britain (which they had fought in the Crimean War), Russia had happily accepted the American purchase offer. In the United States, several newspaper editors openly questioned the purchase and labeled it “Seward’s Folly.” They highlighted the lack of Americans to populate the vast region and lamented the challenges in attempting to govern the native peoples in that territory. Only if gold were to be found, the editors decried, would the secretive purchase be justified. That is exactly what happened. Seward’s purchase added an enormous territory to the country—nearly 600,000 square miles—and also gave the United States access to the rich mineral resources of the region, including the gold that trigged the Klondike Gold Rush at the close of the century. As was the case elsewhere in the American borderlands, Alaska’s industrial development wreaked havoc on the region’s indigenous and Russian cultures. 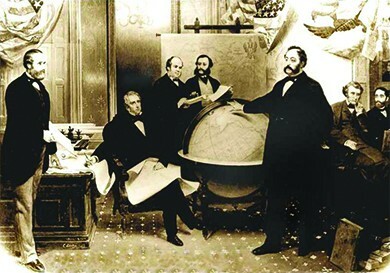 Although mocked in the press at the time as “Seward’s Folly,” Secretary of State William Seward’s acquisition of Alaska from Russia was a strategic boon to the United States. Businesses were not the only ones seeking to expand. Religious leaders and Progressive reformers joined businesses in their growing interest in American expansion, as both sought to increase the democratic and Christian influences of the United States abroad. Imperialism and Progressivism were compatible in the minds of many reformers who thought the Progressive impulses for democracy at home translated overseas as well. Editors of such magazines as Century, Outlook, and Harper’s supported an imperialistic stance as the democratic responsibility of the United States. Several Protestant faiths formed missionary societies in the years after the Civil War, seeking to expand their reach, particularly in Asia. Influenced by such works as Reverend Josiah Strong’s Our Country: Its Possible Future and Its Present Crisis (1885), missionaries sought to spread the gospel throughout the country and abroad. Led by the American Board of Commissioners for Foreign Missions, among several other organizations, missionaries conflated Christian ethics with American virtues, and began to spread both gospels with zeal. This was particularly true among women missionaries, who composed over 60 percent of the overall missionary force. By 1870, missionaries abroad spent as much time advocating for the American version of a modern civilization as they did teaching the Bible. Lottie remained in China through famines, the Boxer Rebellion, and other hardships. She fought against foot binding, a cultural tradition where girls’ feet were tightly bound to keep them from growing, and shared her personal food and money when those around her were suffering. But her primary goal was to evangelize her Christian beliefs to the people in China. She won the right to minister and personally converted hundreds of Chinese to Christianity. Lottie’s combination of moral certainty and selfless service was emblematic of the missionary zeal of the early American empire. 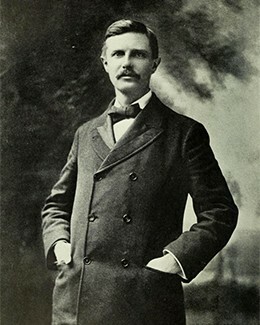 Historian Fredrick Jackson Turner’s Frontier Thesis stated explicitly that the existence of the western frontier forged the very basis of the American identity. While Turner provided the idea for an empire, Mahan provided the more practical guide. In his 1890 work, The Influence of Seapower upon History, he suggested three strategies that would assist the United States in both constructing and maintaining an empire. First, noting the sad state of the U.S. Navy, he called for the government to build a stronger, more powerful version. Second, he suggested establishing a network of naval bases to fuel this expanding fleet. Seward’s previous acquisition of the Midway Islands served this purpose by providing an essential naval coaling station, which was vital, as the limited reach of steamships and their dependence on coal made naval coaling stations imperative for increasing the navy’s geographic reach. Future acquisitions in the Pacific and Caribbean increased this naval supply network. Finally, Mahan urged the future construction of a canal across the isthmus of Central America, which would decrease by two-thirds the time and power required to move the new navy from the Pacific to the Atlantic oceans. Heeding Mahan’s advice, the government moved quickly, passing the Naval Act of 1890, which set production levels for a new, modern fleet. By 1898, the government had succeeded in increasing the size of the U.S. Navy to an active fleet of 160 vessels, of which 114 were newly built of steel. In addition, the fleet now included six battleships, compared to zero in the previous decade. As a naval power, the country catapulted to the third strongest in world rankings by military experts, trailing only Spain and Great Britain. 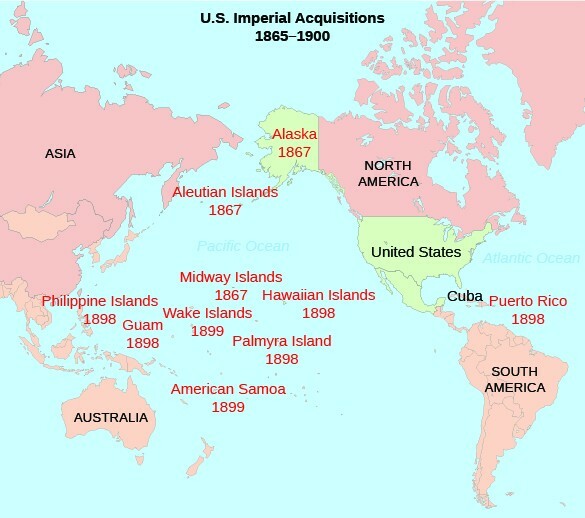 American imperial acquisitions as of the end of the Spanish-American War in 1898. Note how the spread of island acquisitions across the Pacific Ocean fulfills Alfred Mahan’s call for more naval bases in order to support a larger and more effective U.S. Navy rather than mere territorial expansion. The United States also began to expand its influence to other Pacific Islands, most notably Samoa and Hawaii. With regard to the latter, American businessmen were most interested in the lucrative sugar industry that lay at the heart of the Hawaiian Islands’ economy. By 1890, through a series of reciprocal trade agreements, Hawaiians exported nearly all of their sugar production to the United States, tariff-free. When Queen Liliuokalani tapped into a strong anti-American resentment among native Hawaiians over the economic and political power of exploitative American sugar companies between 1891 and 1893, worried businessmen worked with the American minister to Hawaii, John Stevens, to stage a quick, armed revolt to counter her efforts and seize the islands as an American protectorate. 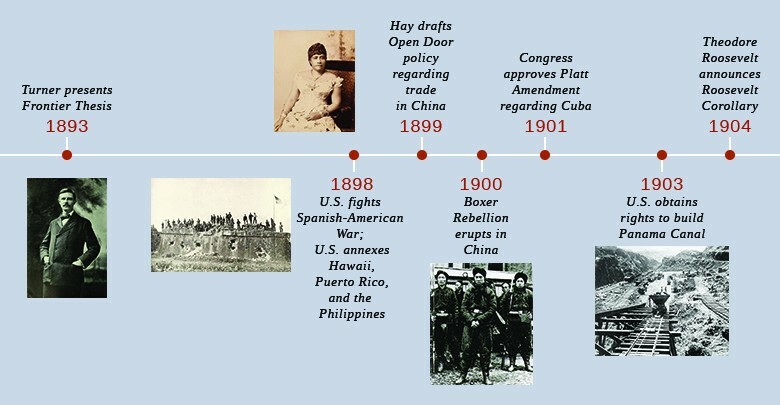 Following five more years of political wrangling, the United States annexed Hawaii in 1898, during the Spanish-American War. 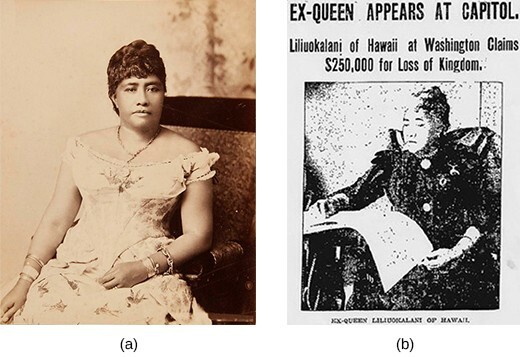 Queen Liliuokalani of Hawaii (a) was unhappy with the one-sided trade agreement Hawaii held with the United States (b), but protests were squashed by an American-armed revolt.